Many clients ask us how can they merge several FB pages into one. Well, Facebook have designed an easy process to do that. 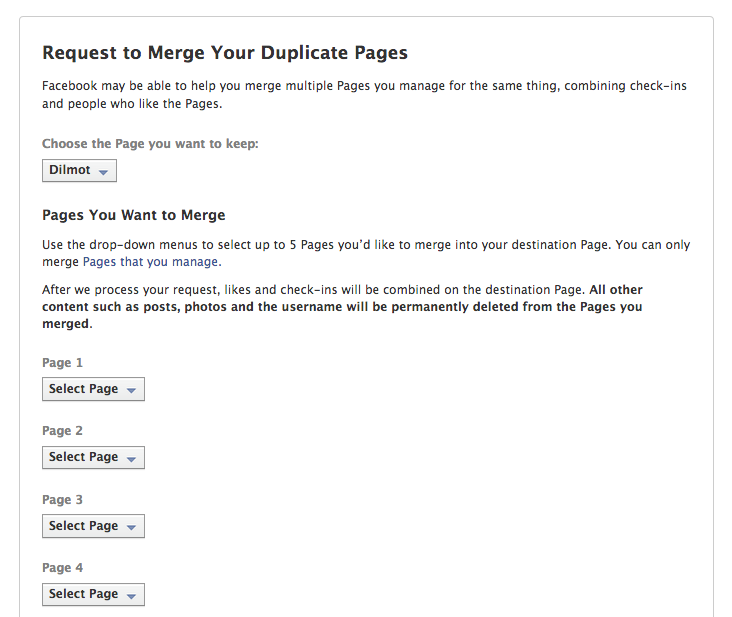 You can select the page you would like to keep, and the page or pages that you would like to merge into it. Use this link https://www.facebook.com/help/contact/?id=238908726149664 so you can get rid of the duplicate pages and migrate its fans to the new page. Great tool! We hope this post is useful! Blog sponsored by Dilmot, the publishing tool for on-line Q&A interviews. Get questions from Twitter and publish the Q&A inside Facebook. Start with a free account today! This entry was posted in How to and tagged duplicate, Facebook, merge, migrate fans, pages on June 27, 2014 by admin.